petition: No More Drawbacks! A Fuel Alternative to end the Pollution Crisis in California! No More Drawbacks! A Fuel Alternative to end the Pollution Crisis in California! California as of right now, has some of the most polluted cities in the entire country. The problem stems from many factors like the dense populations crowding around a few cities like Los Angeles and Long Beach. This issue coupled with drought and wild fires that have happened recently, the air quality has really taken a tole. It has gotten so extreme that health officials state that 1,300 people die annually in California from the air quality alone. But one problem that can be controlled is the excess use of natural gas and petroleum for cars, jets, buses and other vehicles. California uses about 2,409.6 trillion BTU compared to the measly 876.4 trillion BTU from all of the renewable energy sources. That is why California needs another solution to fix it's overflowing amounts of carbon emissions. Many thought that ethanol was the right alternative but soon people realized it is not a good long-term solution. Ethanol is two thirds as fuel efficient as normal gasoline and the burning of ethanol is not much different from burning normal gasoline which means it is still polluting the air. The only reason the EPA markets ethanol as being "clean" is the fact that when growing the corn to produce ethanol, it is taking in the carbon-dioxide. The alternative without drawbacks is algae bio-fuel which can be grown and distributed swiftly unlike ethanol. It is also more efficient being 10-100 times more productive than other bio energy feed stocks. To easily mass produce them, the refineries need to be enclosed with rows of algae farms with little drums on top to create the best environment for the algae to grow. 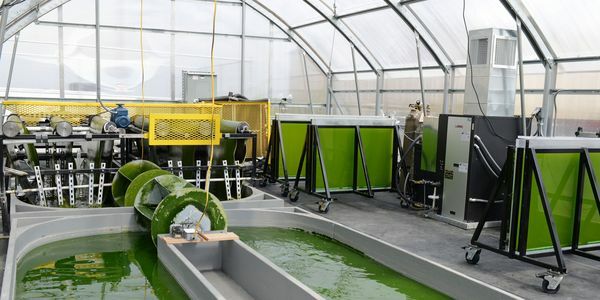 The process of growing the algae and collecting the fuel is actually simple and can be done in less than a few minutes. You first have to extract the oil from the algae cells first using a standard oil press. Then, hexane is used to filter out the chemicals inside the oil so it is pure. The last step involves a process called transesterification where they combine sodium hydroxide with methanol to create the final product of crude oil to fuel cars, jets, planes and other motor vehicles. With already many efforts to reach the goal of clean and affordable oil, it seems that algae is by the far the most promising. Sign this petition to bring awareness about the environmental crisis of California, the non-existent help from ethanol and a new green way of fuel that can pave a new way of clean, affordable and sustainable energy in California.